The third installment of the Snowman Triathlon – powered by Suunto – took place this weekend (Sunday 5th October) from the world-renowned Plas y Brenin National Mountain Centre in Capel Curig, Wales. Event organisers, Always Aim High Events welcomed over 450 competitors to this beautiful and iconic part of Snowdonia to complete their now infamous Always Aim Tri Series. The Always Aim Tri Series comprises of the Slateman, Sandman and Snowman triathlons which are all set in challenging, but very beautiful North Wales locations. The grand prize for the lowest cumulative time from all three events is a trip to the Nevis Triathlon in the Caribbean including flights, transfers, 7 nights hotel stay, and a free race place for the male and female winner. 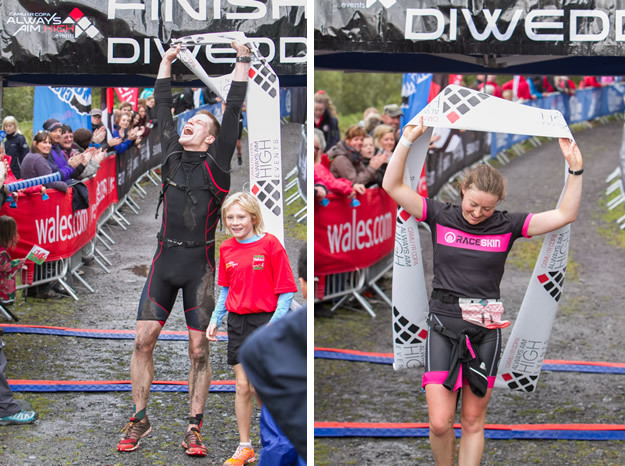 Going into the Snowman, Ewan Brown and Suzie Richards were firm favourites after both picking up wins at the Slateman and Sandman Triathlons earlier in the year. However, to secure the prize they had to tackle one of the UK's toughest triathlons – the Snowman. As competitors lined up in Llyn Mymbyr ready for the swim they were rewarded with stunning views towards the Snowdon horseshoe. With a choice of either the full distance triathlon or the sprint triathlon available, competitors set off on either a 69km or 31km cycle, which took in some of the most beautiful roads and climbs in Snowdonia National Park. Upon completing the cycle the athletes were presented with a challenging but rewarding run to the summit of Moel Siabod and back, finishing at Plas y Brenin. Up at the front end of the racing in the men's full distance category, the glory went to Ewan Brown for the third year running. Brown won the 2012 Snowman after an impressive mountain run on the infamous Moel Siabod and the story was the same in 2013. However, in 2014 a marked improvement in Brown's cycling meant that he created a big lead before he even reached his specialist event – the epic run. Subsequently Brown won the race by over 15 minutes! In the women's race, GB athlete Suzie Richards beat of competition from local competitor Helen Teasdale to romp home in a winning time of 03:40:36. Suzie was delighted to win her trip to Nevis but joked in her post-race interview: “There has to be an easier way to get to the Caribbean”. In the sprint race, Huw Brassington won the male event in a new course record time of 1:40:02. Huw's win meant that became the Always Aim Tri Series Sprint Champion for the second year in a row. In the female Sprint category, the winner was Sarah O'Sullivan with a very impressive time of 02:06:15. "This year's Snowman Triathlon has been by far the best to date. The feedback we have had so far has been brilliant and it's nice to be able to organise an iconic event that is enjoyed by elite athletes and novices alike. I am delighted with how this event has grown, it is fantastic to see hundreds more competitors challenging themselves in this unique environment. "Whats more, the support from the spectators all over the course has been great. We are extremely grateful to the help we have received from the Capel Curig community and to the staff at Plas y Brenin in making the event possible. "I would also like to say a big thank you to our partners, Suunto, Visit Wales, Chain Reaction Cycles , Kinetica, Salomon, Aqua Sphere and Sports Tours International as well as Conwy County Council for all their help and support in organising this event."